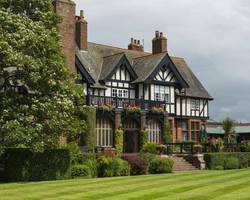 Set in two acres of beautifully landscaped gardens, Piersland House Hotel overlooks Royal Troon Golf Club. This architectural masterpiece is the former home of the Johnnie Walker Scotch Whisky family and now the scene for one of Ayrshire's truly outstanding guest experiences. Guests will experience engaging, timeless ambience and charm when staying At Piersland House. Share an exceptional food and beverage experience with a following of local discerning diners. No Scottish country house experience is complete without an eclectic range of individual styled and contrasting guest accommodations. Guest room choices range from standard, or larger superior rooms all well-appointed with amenities such as tea and coffee-making sets and mini-bar. 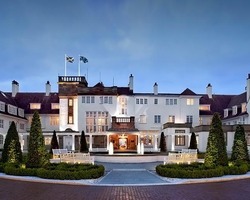 Located on the stunning Ayrshire coast just 55 minutes from Glasgow Airport and 30 from Prestwick, Turnberry offers spectacular views over the Firth of Clyde to Arran, the Mull of Kintyre and Ailsa Craig. The hotel boasts one of Europe's finest leisure complexes, where one can avail of numerous facilities including a magnificent 20 metre pool, hydrotherapy suite, squash courts, saunas, solarium and gymnasium, trekking and tennis are also available on the estate. Each of the 132 luxurious bedroooms and suites are spacious, very thoughtfully equipped and, of course, ensuite. Welcome to the Old Loans Inn, an award-winning four-star boutique hotel in the village of Loans near Troon and part of the privately-owned, proudly independent SimpsInns group. 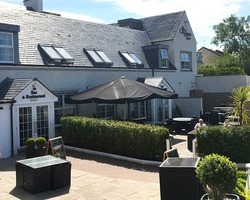 The Old Loans Inn was an authentic 18th Century Scottish Coaching Inn before it was transformed into its current guise as a much sought-after 20-bedroom four-star hotel with a big reputation for quality food at affordable prices and using excellent produce from Ayrshire's local larder. Part of the Old Loans Inn charm has been the ability to provide 21st century luxury, yet maintain its original charm and ambiance by keeping the likes of the original stone walls and feature fireplace which houses the roaring fire in winter. The hotel houses some of the finest bedrooms in Ayrshire; understated luxury and in keeping with a contemporary Scotland theme. Bathrooms include powerful rain showers, and all Inn rooms have king size beds (can be split into Twins) and you'll find space aplenty for your comfort and convenience. A stylish hotel at Glasgow Airport with conference facilities and on-site parking. Holiday Inn® Glasgow Airport hotel places you a one minute walk away from the main terminal at Glasgow Airport. The city centre is a 20-minute drive away. At this hotel you can enjoy: free WiFi throughout, on-site and secure off-site parking at a daily rate, and kids stay and eat free. Stylish guest rooms feature comfortable beds and pillow menus to ensure restful nights. Guests can enjoy a traditional full Scottish breakfast buffet, or enjoy other tradtional Scottish or contemporary entrees. After a long day, relax in the lounge bar and catch live sports on 2 widescreen TVs, or kick back in your room and order from the 24-hour room service menu.